This card will likely be a birthday card for my husband's great-uncle who turns 93 next week. I intended to make this a A2 card, but then cut the shapes a bit too large. While I am not 100% pleased with the colors, I like the end result well enough. -Yellow cardstock cut at 4.75 x 6.75"; a strip of beige cardstock about 1.5" x 6.75" embossed with the pebbles embossing folder. 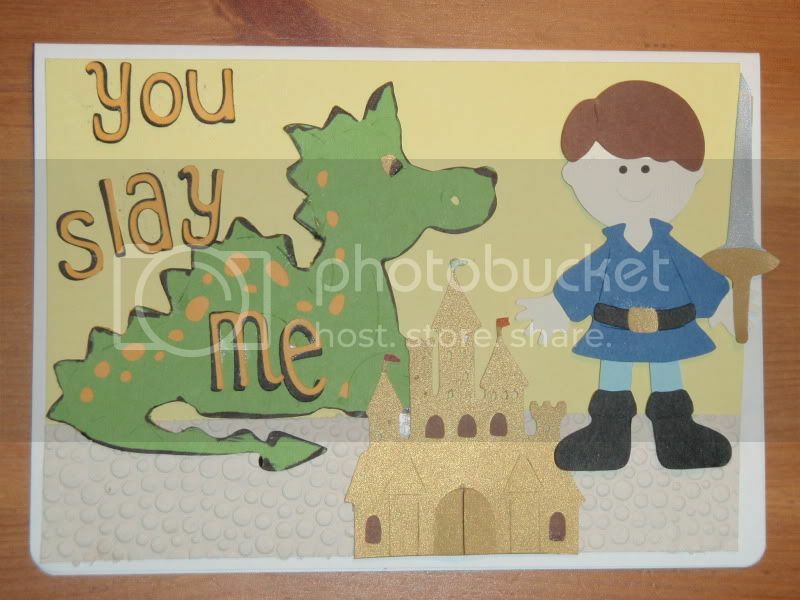 - The boy is the "prince" found on p. 46 of the Paper Doll Dress Up booklet, cut at 3.75". The castle is an accessory to the princess on p. 47 and cut at 3", then trimmed a wee bit from the bottom. The dragon and sword at accessories to the knight on p. 48, cut at 3.25". - The message is cut at .75" using the new Cherry Limeaide cartridge! I ran the letters through my Xyron. I will likely stamp "Happy Birthday" on the inside, once I've decided this is the birthday card.